We met Eva when she was 6 years old. She is a pure Sicilian. And she is... a real lunar, not solar Cirneco dell Etna. Honey-colored, but cool and restrained at first look. Do not expect her attention and credibility to you as a person. It is not for sale for a tasty morsel. And she is a master in hiding emotions and feelings. She does not open her soul to the first who comes. 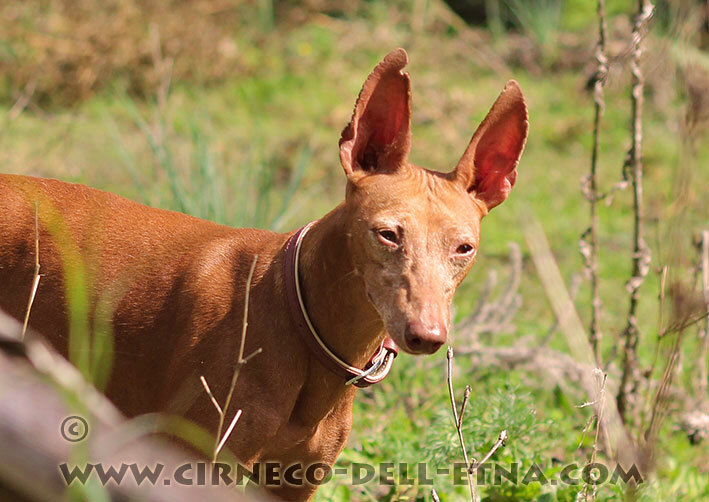 In Sicily they tell: Cirnechi have exactly the same nature as we do, the Sicilians. In our history there have been many aggressive wars and invasions of strangers. Life has taught us to distrust strangers at the first meeting. But if we recognize you as a friend, then we open our hearts to you, and you become our family. With us she is sincere, trusting and loving. Ready for any feat for us. Thankfull for our love and care. Eva- representative of a very rare Sicilian bloodline, descendant of the most beautiful dogs Terremoto and Duca . She has been successfully in exhibitions and is highly appreciated by experts.